Lightweight, contour grip, Hi-Viz orange case is easy to find and fits comfortably in hand. Slide lock design allows for easy control of tape blade, wide base helps keep tape standing upright, removable belt clip and easy-to-read yellow clad blade (not replaceable). Trim and lightweight metallic colored ABS case with durable key ring for convenience. Yellow, blade lacquer-coated for added rust protection, slide lock keeps blade extended as needed. Features a 3' blade standout; polymer-coated blade withstands abrasion; convenient and lightweight; handy for quick measurements; compact size fits in pocket; durable key ring makes it easy to carry anywhere; "tru-Zero" hook for accurate inside and outside measurements. ABS plastic housing with comfortable rubber shell grip. Comfortable rubber coated thumb lever. Lightweight, contour grip, Hi-Viz orange case is easy to find and fits comfortably in hand. Slide lock design allows for easy control of tape blade, wide base helps keep tape standing upright, removable belt clip and easy-to-read yellow clad blade (not replaceable). Slim, metallic-colored ABS case fits perfectly in a pocket. Back of blade provides scale that measures up to 3' diameters; special Tru-Zero hook does double duty as a pivot for drawing circles and arcs Heat-treated spring stands up to regular use; Polymer-coated blade for long life. High impact, high-visibility yellow case stands, High-contrast blade for easy readability with a 7' standout. High impact, high-visibility yellow case stands, High-contrast blade for easy readability with a 7' standout. Power return feature, with automatic bottom lock, streamlines tape operation. Yellow, high visibility case with belt clip on back. Special Tru-Zero hook does double-duty as a pivot for drawing circles and arcs. Polymer coating and heat-treated spring extend life. Pocket size ideal for office or home. High strength black case. Yellow clad blade is flexible with bold graduations on yellow background. Black markings one side only. Consecutive inches to 1/16ths bottom edge, first 12" to 1/32nds; 16" centers designated by diamond; every 12th inch in red. Entire blade coated with heavy-duty Mylar polyester film for unbeatable durability. Two-rivet, corrosion-resistant hook stands up to continuous use. Special Tru-Zero hook does double-duty as a pivot for drawing circles and arcs. Die cast metal case. Pocket size ideal for office or home. High strength black case. Yellow clad blade is flexible with bold graduations on yellow background. Black markings one side only. Consecutive inches to 1/16ths bottom edge, first 12" to 1/32nds; 16" centers designated by diamond; every 12th inch in red. Power return feature, with automatic bottom lock, streamlines tape operation. Yellow, high visibility case with belt clip on back. Special Tru-Zero hook does double-duty as a pivot for drawing circles and arcs. Polymer coating and heat-treated spring extend life. High impact, high-visibility yellow case stands, High-contrast blade for easy readability with a 7' standout. Entire blade coated with Mylar polyester film for durability. Heat treated spring stands up to repeated usage, positive blade lock won't creep, graduated in 16ths of an inch. Special Tru-Zero hook does double-duty as a pivot for drawing circles and arcs. Belt clip on back of case. High impact, high-visibility yellow case stands, High-contrast blade for easy readability with a 7' standout. Durable bi-material case with belt clip. Self locking blade with fractional read blade graphics, magnetic end hook and Tru-Zero hook for accuracy. Lightweight, contour grip, Hi-Viz orange case is easy to find and fits comfortably in hand. Slide lock design allows for easy control of tape blade, wide base helps keep tape standing upright, removable belt clip and easy-to-read yellow clad blade (not replaceable). High impact, high visibility yellow case with high-contrast blade for easy readability. Three-rivet, corrosion-resistant hook moves to allow accurate inside/outside measurements; 7' standout. 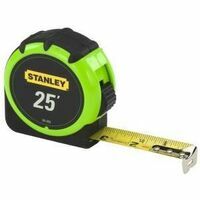 Stanley Tape Rule, High Visibility, SAE Measuring System, 25 ft Blade Length, 1 in Blade Width, Steel Blade, Polymer Coated Blade, Yellow With Black/Red Markings Blade, Graduations: 1/32 in First 12, 1/16 in Thereafter, 16 and 19.2 in Stud Markings, 8 ft Standout, Automatic Rewind, Top Forward Locking, 3 Rivet Hook, Closed Case, ABS Case Automatic blade lock holds the blade in extended position. Orange ABS case with a non-slip co-molded rubber grip, steel reinforced end hook, durable clear coat blade protection and recessed lock release. Power return feature, with automatic bottom lock, streamlines tape operation. Yellow, high visibility case with belt clip on back. Special Tru-Zero hook does double-duty as a pivot for drawing circles and arcs. Polymer coating and heat-treated spring extend life. Nylon bond blade protection; 5-point reinforced frame; fractional scale; optimized hood designed for scoring; stamped steel belt clip; lanyard ready. Entire blade coated with heavy-duty Mylar polyester film for unbeatable durability. Two-rivet, corrosion-resistant hook stands up to continuous use. Special Tru-Zero hook does double-duty as a pivot for drawing circles and arcs. Die cast metal case. Easy readability, 7' standout, secure blade lock won?t creep. Special Tru-Zero hook does double-duty as a pivot for drawing circles and arcs. Entire blade coated with Mylar polyester film for added durability, heat-treated spring stands up to repeated use, 16" and 19.2" stud center markings. Three-rivet, corrosion-resistant hook moves for accurate inside/outside measurements. Graduations printed in fractions and decimal equivalents. Rounded blue ABS case fits your hand for comfort and withstands rugged use on the job site. Positive toggle lock holds blade securely at any length. Self-compensating end hook for inside and outside measurements. Built in bumper reduces shock when blade is retracted. Lightweight, high strength, Hi-Viz orange case easy to find on the job; fits perfectly in the hand and into most tape holsters. Bright yellow blade has clear easy-to-read numerals with cushioned blade return. Removable belt clip. Toggle lock is positioned for convenient operation and holds the blade securely. Magnetic end hook is a time-saver for framers, HVAC installers, and more. Powerful dual magnets can also serve as a pick-up tool. Orange with a non-slip, co-molded rubber grip, ABS case stands up to the toughest work site. Non-slip rubber blade lock button. Use for one-man measurements of steel framing and drop ceiling grids. Durable bi-material case with slip resistant rubber over mold with belt clip on back of case. AirLock rubber slide lock, multi-catch hook,Tru-Zero hook with nail head slot. Accurate interior and exterior measuring with large, easy to read blade graphics, nail slot for measuring radius, 10' blade standout. Auto lock brake. 5-point reinforced frame. Optimized hook designed for scoring. Lanyard ready. Zero tolerance hook. Nylon bond blade protection. Fractional scale and stamped steel belt clip.